Instead of dreading the next rainy day, why not celebrate the rain? 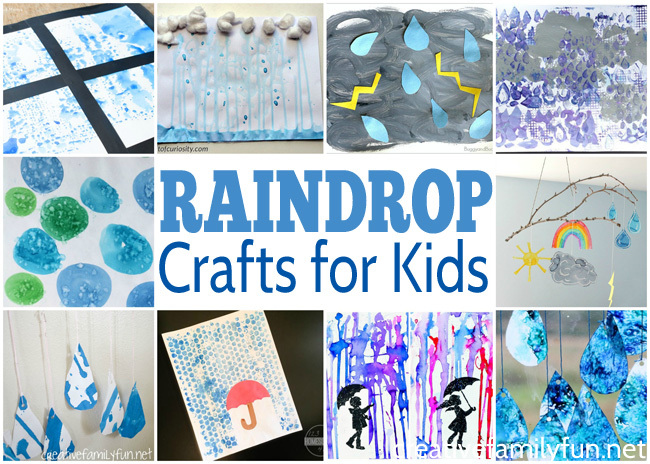 These fun Rain and Raindrop Crafts for Kids are all fun ways to make a rainy day less gloomy. Let’s get creative and celebrate the rain. All of these fun crafts are easy to do. You’ll find some classic art techniques and some unique twists. These ideas are perfect for kids of all ages. 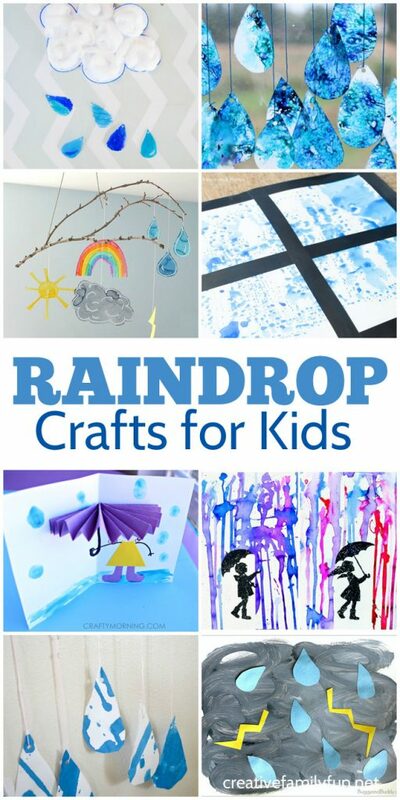 Your youngest kids can get creative with a Raindrop Mobile or a Toddler Rain Cloud Craft. Let your older kids create some Silhouette Rainy Day Art or Monoprint Rainstorm Art. You can even use the rain to help you create! Come on, let’s get creative and find a fun project (or two) to do with our kids! Use a fun painting technique and a bit of nature to make this pretty Raindrop Mobile craft. Celebrate both the sun and rain with these simple Sun and Rain Sensory Bottles. Make a simple puffy Rain Cloud Suncatcher with Preschool Inspirations. Use crayon and watercolor resist to create this simple Let’s Make Rain art project at The Educators’ Spin On It. Print with bubble wrap to create this Umbrella and Rain Craft from 123 Homeschool 4 Me. Use a simple printmaking technique to create this pretty Rainy Day Window Art from Munchkins and Moms. Make an adorable 3D Umbrella Rainy Day Card from Crafty Morning. Use crayon shavings to make gorgeous raindrops for these Raindrop Suncatchers from Pre-K Pages. Make a fun Clouds and Rain Weather Windsock Craft from A Dab of Glue Will Do. 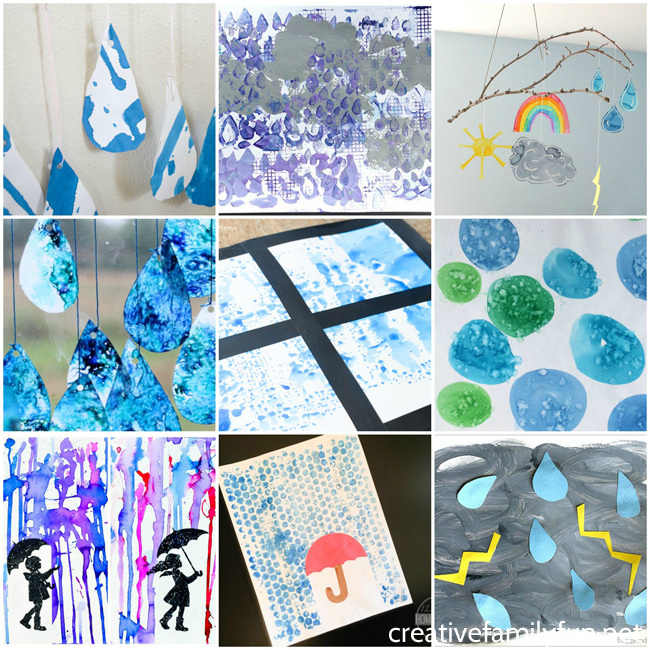 Create with drip painting to make this simple Rain Cloud craft from Gift of Curiosity. Use a thunderstorm as inspiration to create this beautiful Weather Art from Buggy and Buddy. Take a printable silhouette and use it to make this pretty Rainy Day Art from Adventure in a Box. Create with an eye dropper to make this simple Looks Like Rain! craft from What Can We Do With Paper and Glue? Make this simple Sun and Rain Cloud Paper Craft from Easy Peasy and Fun. Even toddlers can get in on the fun with this easy Rain Cloud Craft from My Bored Toddler. Use a free printable pattern to help you make this 3D Rain Clouds Craft from I Heart Crafty Things. Be inspired by a rainy day with this Rain and Wind Process Art Activity from Play to Learn Preschool. Use a monoprint technique to make some Rain Storm Art from Keeping Life Creative. Celebrate all the weather with this fun Weather Mobile project from Buggy and Buddy. Use the rain to help you create this beautiful Rainbow STEAM Art Project from Rhythms of Home. This simple Painting With the Rain art project from NurtureStore is fun for a rainy day. Learn about the science of color when you let the rain help you create this beautiful Butterfly Rain Art from Mum in the Madhouse. Watercolors and rain combine to create some fun art with this Rain Art Project from Adventure in a Box. If you enjoyed these rain and raindrop crafts for kids, you can share the photo above on Facebook or save the photo below on Pinterest.